Landfills are built upon a non-permeable membrane to prevent containments from leaching into the ground water. 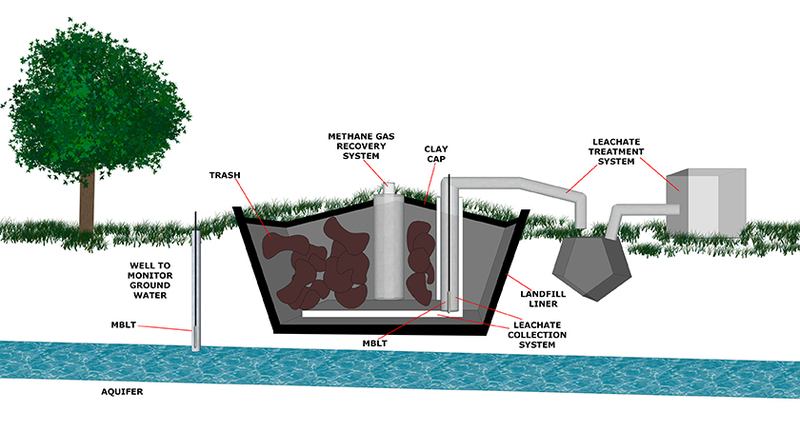 Rain will accumulate within the landfill, and once it does, it’s referred to as leachate. As you can imagine this is not a clean fluid; it consists of soluble materials from our trash and is highly inconsistent. Leachate can be corrosive and a biological hazard, which makes its disposal very important. In a perfect world, the leachate would flow naturally to the local wastewater treatment facility; but as we know, the world doesn’t always operate 100% perfect. Areas of collecting leachate require pumping periodically to prevent leaching into our groundwater. For these scenarios a 4”-6” bore hole is placed at a horizontal angle to the base of the landfill, and in some cases a vertical well. Technicians will place a slim pump typically outfitted with wheels to reach the bottom of the bore or a standard submersible pump. recommended. Its ETFE Teflon sensing element makes compatible with the leachate.